Christmas Tree Farm Tradition - Hej Doll | Simple modern living by Jessica Doll. The holidays are my favorite time of year. Although they can be stressful, I just love all of the festivities and traditions that go on. Or maybe I’m a sucker for the twinkling lights and holiday cheer. I know it’s a big deal in most households, but every year during the weekend after Thanksgiving, we go pick out our tree. 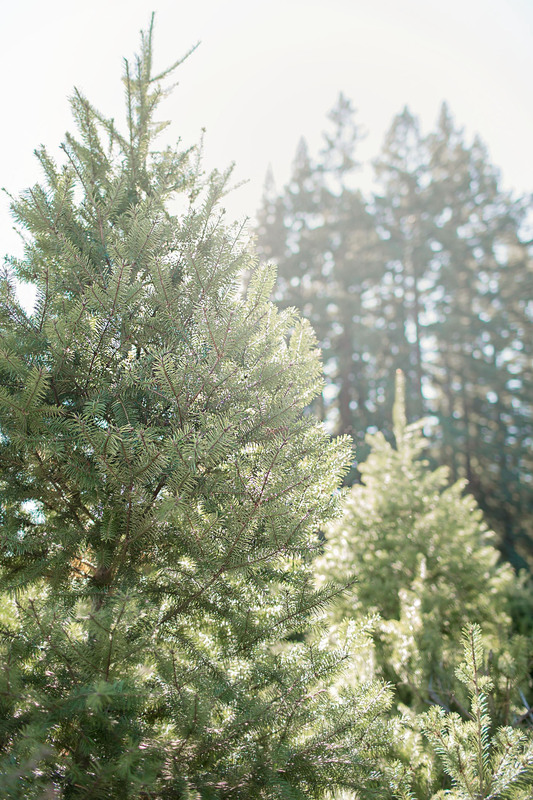 Last year, we tried something new and went to a Christmas tree farm in the mountains near our home. This year we went again, and it’s a tradition I really enjoy and hope will stick around. The weather was warmer for a Winter’s day, and the sun was shining bright. I worried about how busy the farm might be since when we went last year it was pouring rain and we were the only ones crazy enough to still go. There were quite a few people there, but the farm is spread out over the hills so it’s not hard to find some quiet. The White Fir trees that we love are tucked away from the main trees and if you don’t look hard enough, you’ll miss them amidst the others. The easiest way to spot them is to look for the blue hued trees scattered around ones that are more yellow. Once we found ours we quickly claimed it and headed back up the hill to pay and secure it on my car. The drive home was just as nice as the drive up, but along side us on the freeway were several other cars with trees perched on top. I couldn’t help but giggle, knowing that all these trees are headed to bring cheer to someone’s home. My thoughts fast forward to next year, and what we’ll do then but they quickly return. I just want to live in this moment. I’m happy to share that I wrote this post is part of a holiday series by my friend Annie. Go take a look to see other holiday posts from bloggers around the world. The trees look like something out of a movie! I can’t wait until we have our house so we can also start some family traditions. I know, right? I love them. I think you can start small even if you’re not in your own house. I used to drag my family into my holiday ideas all the time when I still lived with them, haha. What a lovely tradition, we usually just go across the street to get our christmas tree your tradition is way better than mine! We used to just go to lots too, and had our favorites. I just never realized how easy it was to go to a farm or get a permit to cut your own. I have friends who get permits to cut in the forest for something crazy, like only $10! I just heard about tree rentals from our city where you pay to rent a tree, then return it to be planted somewhere in the city after you’re done. I think it can be as fun as you’d like. Maybe do something else too like drink hot chocolate or hot cider when you bring it home to decorate. Omg. That first picture from behind makes Soren look SO much older! Look at the all the heights of your boys. 🙁 Lol. And woah at that last photo – super pretty. I used to cut down a tree every year with my parents. It is such a great tradition – especially picking out the exact tree you want! That’s so sweet. I’m a little picky about my trees, so it works perfect for me, ha! these photos are completely dreamy, Jessica! i’m pretty sure i can smell the pine from here 😉 i love seeing how your sweet family celebrates! I wouldn’t mind having this activity for a holiday tradition every year! It’s my first time to actually know what the different (real) Christmas trees smell like, and I’m even more obsessed with the holidays!